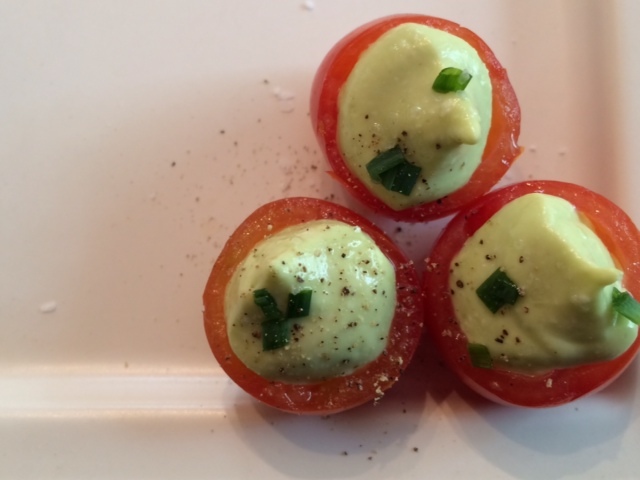 These pop-able tomatoes are a delicious snack, but they can also do double duty as a healthy appetizer this weekend. A protein and a veggie all stuffed into one little bite. Wash tomatoes and cut the bottoms off. (The tops, where the stems grow, make a sturdier base.) Use a small knife or the small end of a melon baller, and scrape the insides out of the tomatoes; leaving only the outer shell. In a small cuisinart, add cottage cheese, avocado, and salt & pepper to taste. Blend until smooth and creamy. Spoon the filling into the hollowed-out tomato shells. (For a fancier presentation, I like to pipe the filling in.) Take a few sprigs of chives, and gently cut off tiny pieces to sprinkle over the top.